Because pervious concrete acts so differently than traditional pavement, it can spur a lot of questions. Is it durable? What happens to oil from cars? Does it get clogged by leaves and debris? The aim of this post is to answer some of those questions. At Custom Concrete Contracting, we’ve been installing pervious concrete for years, and we truly believe in its effectiveness for reducing stormwater runoff while providing a solid foundation for parking and driving. 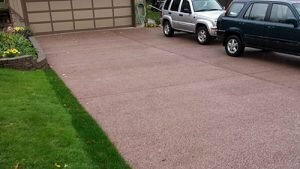 Is pervious concrete durable? How long does it last? Pervious concrete is quite durable. One key component here — much like with traditional concrete — is the installation. Properly installed pervious concrete can last decades, depending on how it is used and maintained. 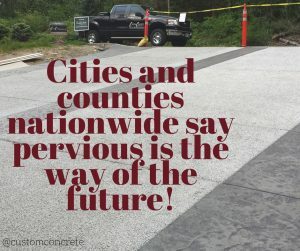 We’ve been seeing huge increases in the use of pervious concrete for such things as parking lots, sidewalks and driveways throughout Whatcom and Skagit counties. What happens when oil drips onto pervious concrete? Research shows that between 97.6 and 99 percent of oil that drips onto pervious pavement is trapped and biodegraded before it ever makes it into the soil. Here’s how it works. Because pervious concrete is full of air voids designed to allow water to filter through, much the same happens with oil. It slowly seeps through the concrete, clinging to the massive surface area of the many voids. Over time, it is eaten by naturally occurring bacteria and fungi, which break down the oil into simpler compounds that are released into the atmosphere. Does pervious concrete get clogged? It can get clogged, but regular maintenance can prevent that from becoming a problem. Especially if pervious concrete is located under trees or near areas where silt, soil or fine plant matter is washed across the concrete during rainy weather, the abundance of small particles can limit the ability of rainwater to penetrate the concrete. Sweeping the concrete of debris helps tremendously, and regular pressure-washing — just like you would do to traditional concrete to keep it clean — can restore the porosity of your pervious concrete. Custom Concrete Contracting crews know how to install pervious concrete surfaces, and we do them right ― the first time! 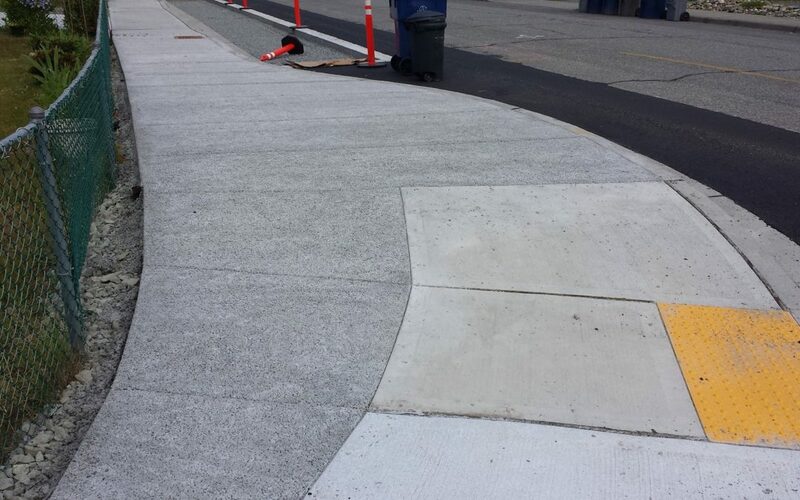 Our concrete finishing company has been pouring and finishing pervious/porous concrete in Bellingham and other cities throughout Northwest Washington since 2009, and our crew’s experience and training have made Custom Concrete a recognized expert in the field of pervious concrete installation throughout Whatcom, Skagit and Snohomish counties. Give us a call today to chat about your next pervious/porous concrete job.